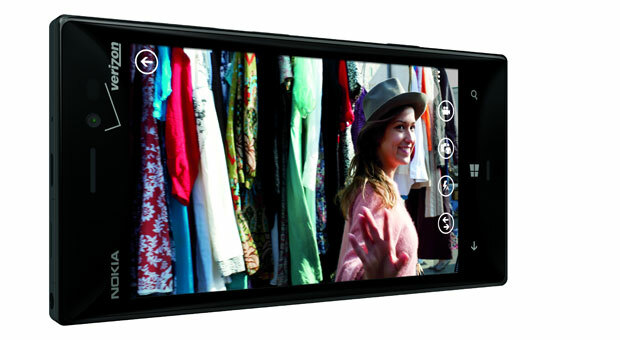 If you've heard enough of Nokia's near future plans for its Lumia range, sorry -- there's more. While the company's official event isn't until next Tuesday in London, that hasn't stopped it from announcing the Lumia 928 on Verizon. Again. Nokia's latest installment supplants the Lumia 822 and HTC's 8X for the US carrier, matching the camera specifications (Carl Zeiss f/2.0 lens, 8.7-megapixel sensor) we saw in the Lumia 920 and pairing it all with a potent xenon flash. There's also high-amp mics and a 4.5-inch OLED (1,280 x 768) display protected by a layer of Gorilla Glass. Inside, you'll find a capable 1.5GHz dual-core Snapdragon S4 processor, 2,000mAH battery and 32GB of storage for all those low-blur photos. As for the phone itself, compared to the bright (admittedly chunky) looks of its predecessor, we're looking at a toned-down refresh, in black and white options, with a more squared design aiming to complement those Windows Phone Live Tiles. Contactless charging and NFC are both built in, as are all those extra Nokia software additions, including Here maps and Nokia Music. It'll launch in the US on May 16th, priced at $99.99 with a mail-in rebate, while you'll also pick up $25 of credit for Windows Phone apps and games if you decide to sign up. Nokia's got an officially sanctioned hands-on after the break -- expect to see our opinions on it next week. 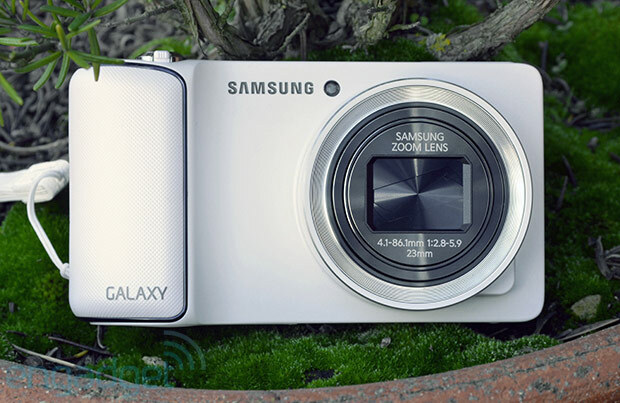 Slapping Android on a point-and-shoot worked surprisingly well for Samsung with the Galaxy Camera, but the device did have flaws -- not least its size and inability to make phone calls. 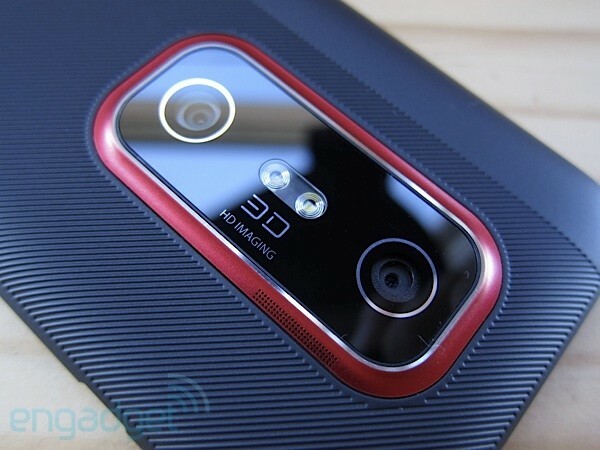 A rumor that originated on SamMobile a few days ago suggested that the South Korean handset maker is working on a sequel called the SM-C1010 (or possibly "S4 Zoom") that adds an ear piece and shrinks the screen down to 4.3-inches from the original model's 4.8-inch display. Another rumor at Hi-Tech.Mail.Ru hints at a smaller 10x zoom, instead of 21x. Now, this very same SM-C1010 model number has cropped up on the Bluetooth SIG's website, leading us to believe that something is up. The rumors also point towards this mysterious handset having a 16-megapixel sensor, qHD AMOLED display, 8GB of built-in storage along with a microSD card slot and Bluetooth 4.0 Low Energy support. At first glance, a smaller screen with fewer pixels may not sound too appealing, but if it results in a cheaper, longer lasting and more pocketable device, then we might be persuaded. 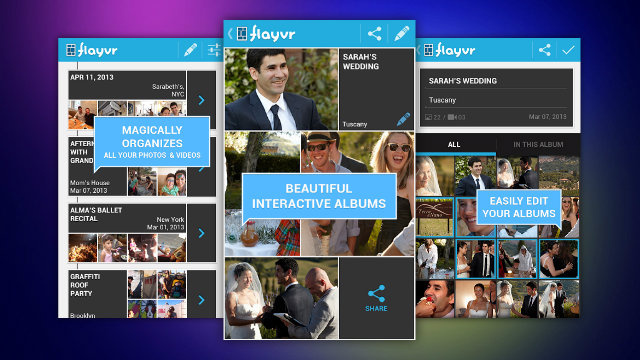 iOS/Android: Flayvr organizes your photos and videos into moving-picture albums on your device that can then be easily shared with friends via the web. The app is actually slightly reminiscent of HTC Share in that you get a collage of pictures and videos, and the images animate to make your albums feel more active and alive. Flavyr differs from Gallery replacement apps like QuickPic in that it doesn't pull up every photo you've ever taken, but instead attempts to curate them into related collections. You can also share a Flayvr album by uploading it to the web and sending your friends a simple simple link, similar to Vine or Instagram (minus the social network aspect). Let's be honest: it's doubtful we'll ever get to directly recreate the skydiving antics of Google I/O 2012's opening keynote. Some of us on the I/O 2013 floor, however, could get the next best thing. As part of a Google Maps API showcase, Portland-based Instrument has developed a Map Diving game for Chrome that has players soaring over real locations to reach Pilotwings-style checkpoints. The version that will be at the event links seven instances of Google's web browser, each with its own display; gamers fly by holding out their arms in front of a motion camera like the Kinect or Wavi Xtion. 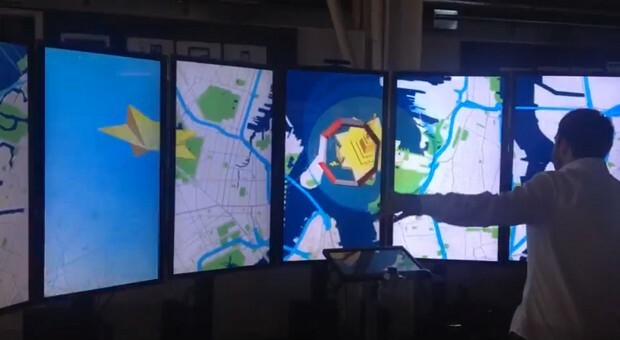 Sergey Brin probably won't be waiting for anyone on the ground once the demo's over, but Instrument hints in a developer video (after the break) that there could be a take-home version of Map Diving after the code is tuned for a single screen. Either way, we can't wait to give it a spin. 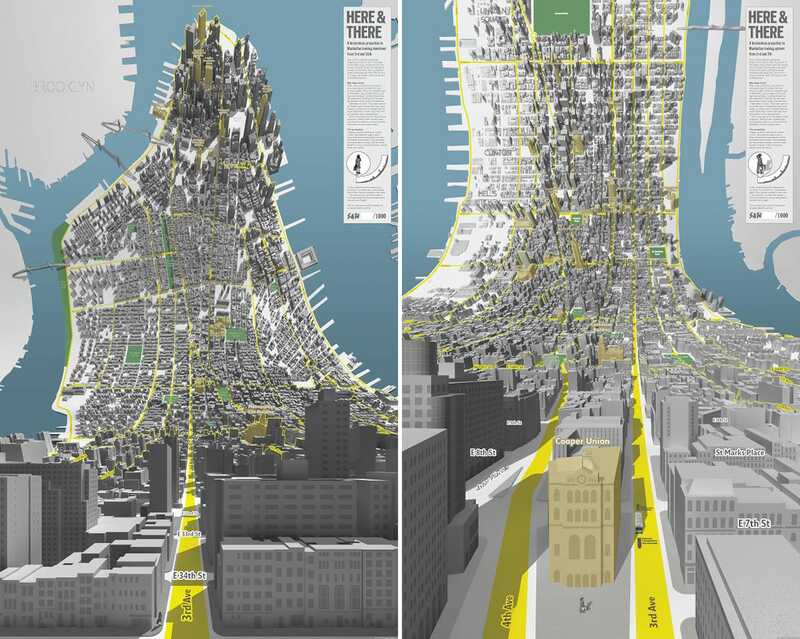 London-based design firm BERG created these two 3D maps of Manhattan, which look like a scene out of "Inception" (via Curbed NY). Called "Here & There," the horizon-less maps make it appear as if the city is curling up and over you. One view looks uptown from 3rd and 7th, and the other downtown from 3rd and 35th. It was made with "a combination of city manipulations in modeling software" and both maps are now a part of the MoMA's permanent collection. "The ability to be in a city and to see through it is a superpower," BERG explains about the project. "It's how maps should work." The images are both three feet tall and two feet wide, and are still available to purchase at BERG London for roughly $150. Remember the EVO 3D? Swap out the HTC logo for an Amazon one, and you just might be onto something. According to a new Wall Street Journal report, one of the world's most famed forkers of Android is looking to expand its mobile portfolio by adding the one crucial device it lacks: a phone. As the story goes, the company has been toiling on a pair of smartphones as well as an "audio-only streaming device," all to "expand its reach beyond its Kindle Fire line of tablet computers." If you'll recall, we've heard that Amazon was dabbling in similar works since at least 2010, but the notion of expanding the Amazon ecosystem is now more pertinent. One of those phones is a higher-end device that offers up a glasses-free 3D display -- it's bruited that it would use "retina-tracking technology" to enable visuals that "seem to float above the screen like a [Tupac?] hologram." In fact, that eye-scrolling technology that was initially rumored to be a part of the Galaxy S4 may instead make its debut on Amazon hardware. Of course, rumors of an Amazon phone have been running just about as long as rumors of a Facebook phone, but it seems that the company is (still) making a very concerted effort to further expand into the hardware arena. We're told that the prototypes are being nurtured within Amazon's Lab126 facility in Cupertino, "where each of the devices have been under development, the efforts are known as Project A, B, C and D, or collectively as the Alphabet Projects." If all goes well, Amazon could release at least some of these products in the coming months, but there's also the chance that every last one of 'em could be "shelved because of performance, financial or other concerns." Come to think of it, it's been a hot minute since Amazon threw a launch party for anything -- what say we change that, Jeff? It has the makings of a film -- but the fallout from one of the world's most sophisticated ATM heists is very real. 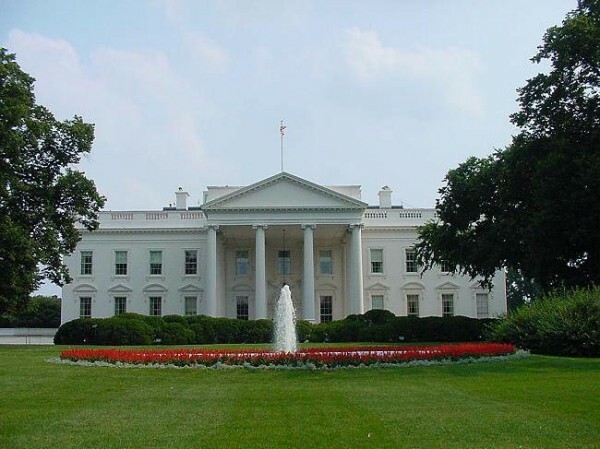 The New York Times is reporting that a massive team of criminals worked in concert in order to grab some $45 million in a matter of hours over the course of two operations. The sheer scope of the project is hard to wrap one's mind around, involving trained personnel positioned in over two dozen countries. Earlier today, federal prosecutors in Brooklyn "unsealed an indictment charging eight members of the New York crew, offering a glimpse into what the authorities said was one of the most sophisticated and effective cybercrime attacks ever uncovered." In essence, the hackers were able to infiltrate various credit card processing companies and raise withdrawal limits on prepaid accounts -- from there, cashing crews hit thousands of ATMs, socking away millions in the process. Hit up the source link for the full read; it's a wild one, for sure. Facebook's two-year-old Open Compute Project is fast becoming a potential cure-all for servers, with efforts underway that tackle efficiency, storage and monolithic design. 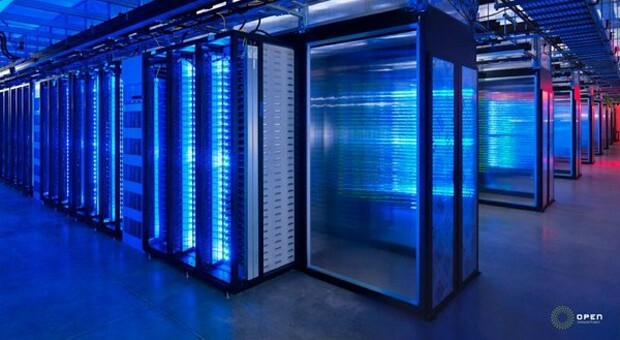 Its next target: the frequently closed-source, small-scale world of network switches. The OCP team wants networking devices as open and scalable as the servers underneath them, and it's teaming up with heavy hitters such as Broadcom, Intel and VMware to make that happen. Unlike past initatives, though, there isn't an obvious template to work from. When development starts at the OCP Engineering Summit on May 16th, the alliance will be starting from scratch -- which suggests that we'll be waiting a long time to see what truly flexible switches can do. Whether you're a virtuoso musician or the tone-deaf bane of karaoke night, there's probably been at least one point in your life where you've felt almost certain that the little ditty you just randomly hummed could be the song to end all songs. But just as quickly as these blasts of inspiration hit us, they'll slip away into nothingness no matter how hard we try to grasp on. With ScoreCleaner Notes for iOS, though, you'll be able to turn your every musical vision into an eternal tune, be it for better or worse. 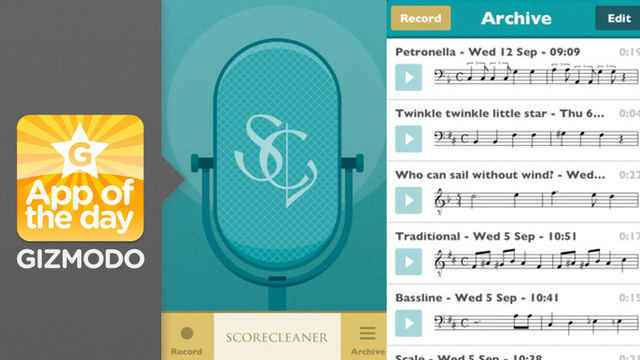 Developed by Sven Emtell as part of his computer engineering master's degree at Stockholm Music University, the app allows you to notate any song you sing without any musical background required. Simply hum the tune into the device's microphone, and the app will immediately display the notated version on the screen with accompanying key, tempo, and time signature. You're then free to share your masterpiece over the social media sites of your choice. Simply humming a tune from memory is highly unreliable, and even if you make a voice recording, it's near impossible to recreate your exact original intent. When a tune is written out, however, you're providing yourself or the music-maker of your choice with a perfectly laid out map into your mind's musical ambitions. And while you don't necessarily need to know how to read music to use the app, for those that do, a handy directory offers the first few notes of each piece so you can find what you're looking for and quickly. 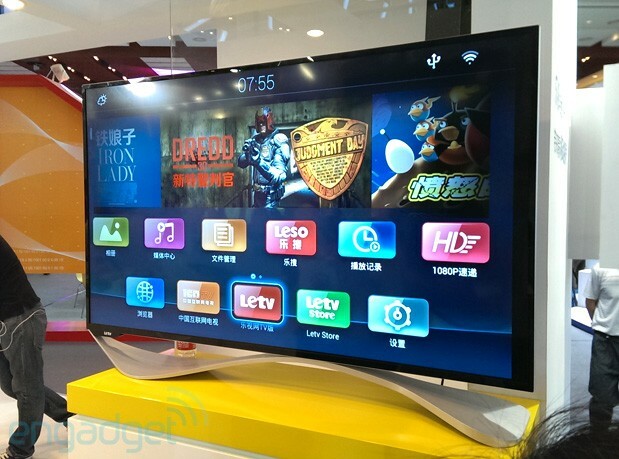 Quad-core smart TVs? Move over, Samsung and Haier, because another company's now joining the party. At a press event in Beijing yesterday, Chinese video content provider LeTV announced its first TV series dubbed "Super TV." Despite the cheesy name, there are a handful of big names behind it: Kai-Fu Lee's Innovation Works, Qualcomm, Foxconn and Sharp. The last two aren't surprising considering Foxconn's parent company, Hon Hai, is an investor of Sharp as well as LeTV. It's also worth noting, though, that Hon Hai already has a deal with RadioShack to make and sell a 60-inch TV, the RS60-V1, in China since January. The flagship X60 (pictured above at GMIC Beijing) features an aluminum alloy body that encases Sharp's 10th-generation 60-inch 1080p panel -- as featured on the RadioShack TV -- with 120Hz 3D, on top of a 1.7GHz quad-core Snapdragon S4 Prime MPQ8064 (with 2GB of RAM and Adreno 320 graphics), dual-band WiFi and S/PDIF optical output. You can also add an optional 2.4GHz gyroscopic remote control and a PrimeSense motion sensor just for giggles. But most importantly, LeTV now streams over 2,000 TV apps as well as some 90,000 TV episodes and 5,000 movies for free (LeTV claims to own the rights to 95 percent of the video content). So, the ¥6,999 or $1,140 price tag seems a steal for the X60. There will also be a 39-inch 1080p (likely 2D only), dual-core S40 model priced at ¥1,999 or about $330, and both TVs will be available by the end of June. Google Earth's desktop version added Leap Motion controls in version 7.1, and now its Android counterpart has picked up a few new features. Available today, version 7.1 introduces Street View which lets users take Pegman from space to your neighborhood with the power of a double tap. Search is also enhanced with updated location suggestions and improved directions that displays routes for transit, walking, biking and driving in 3D. Rounding out Earth's new feature set is a revamped interface that lists layers like Panoramio Photos, 3D buildings and Wikipedia on a slide-out pane. 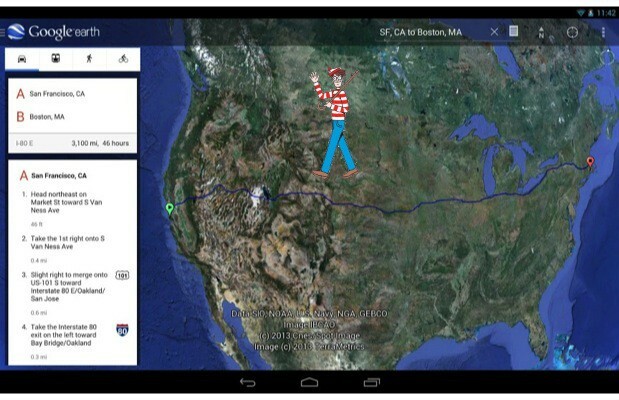 So, if you're having trouble figuring out where your good friend Waldo is, perhaps this refreshed app will assist you with your quest. 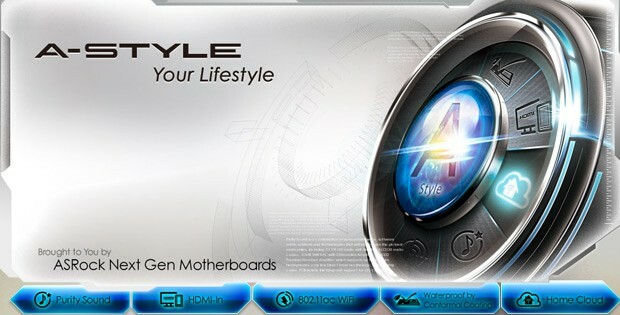 Swing by the source link below for more details. Just a little over a week after Samsung introduced the 7-inch Galaxy Tab 3 to the world, and it's already made its way to the FCC for approval. 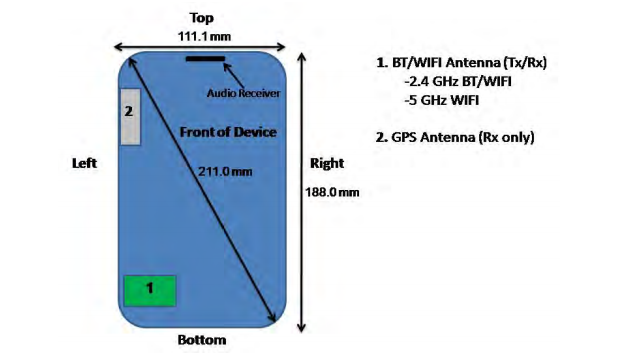 There's not much to say here that we don't know about, but as expected, this particular model is WiFi-only, with no LTE or voice-enabled bands mentioned in the documentation. As a reminder, the Tab 3 has relatively modest specs with a WSVGA (1,024 x 600) TFT screen, a dual-core 1.2GHz processor, 8GB or 16GB of storage (expandable up to 64GB), a 4,000 mAh battery, a rear 3-megapixel camera and a front 1.3-megapixel one. It's set to ship with Android 4.1 some time this month, with a 3G version following in June. Though we're not sure of its exact drop date, we hope it's after a certain tech conference next week for the sake of our sanity. 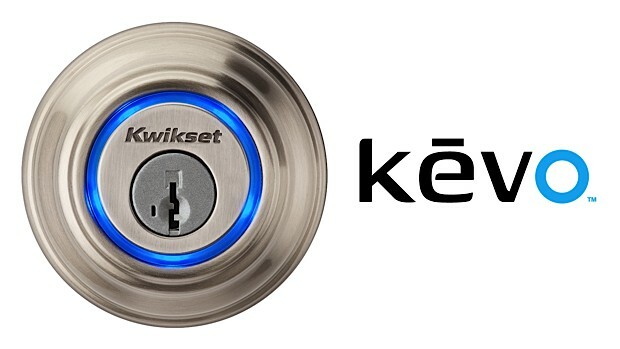 It's not the first time that Kwikset's dabbled in wireless locks, but today the company's introducing Kēvo, a smartphone- (and tablet-) friendly lock powered by UniKey. The concept is pretty simple: pair a handset (running a special app) with Kēvo via Bluetooth, and simply touch the deadbolt to lock or unlock your door. A keychain fob is also available for those who have not yet joined the smartphone revolution. 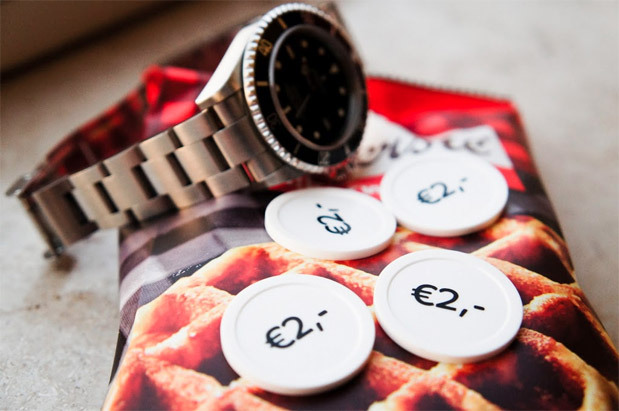 Kēvo only responds to touch when an authorized device or fob is detected nearby. A triple tap lets anyone lock your door, which is useful if a visitor leaves after you. The deadbolt is battery-powered using four AA cells that last more than a year with normal operation. It features a ring of RGB LEDs for feedback and a standard physical key for backup. Most of the magic is made possible by tech developed by UniKey. The key (natch) to the entire system is the Kēvo app which lets you manage eKeys. Once logged into the app, you can send and delete eKeys, or transfer them to another device (this also deletes the eKeys associated with a lost handset, for example) -- you can even create eKeys that only work once. Currently, the app is only available for iOS, which is a major limitation, but it supports push, email and SMS notifications and keeps a detailed log of which eKeys have accessed Kēvo and when. Pricing and availability remain a mystery, but all in all the system looks pretty neat. Stay tuned for more details, and check out link below. Update: And just like that, ASRock has added more info about the HDMI input, including a demo video which you can find after the break. Are your eyes bored today? Look at this right now. 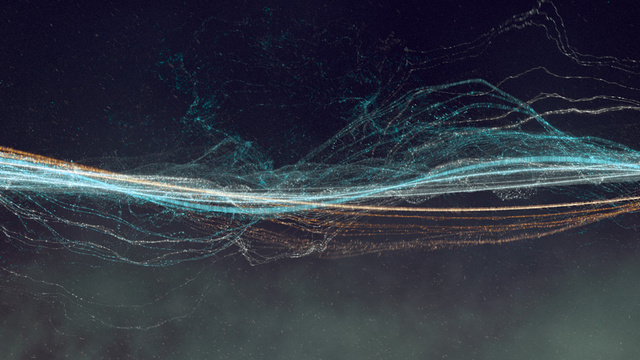 It's a computer animation by computer artist Daniel Sierra, and it will mesmerize you, if only for a few minutes. The concept of universal building blocks that can be assembled to form complex structures is something I find very exciting and alluring. Sound follows this concept in that any sound, for example a snare drum or a human voice, can be deconstructed as the summation of varying sine waves; hence making sine waves the building blocks of sound so to speak. This concept, which comes from the Fourier Series (named after Joseph Fourier) was the inspiration for my thesis, "Oscillate". And it begins: back-to-school season. Even though some students are still embroiled in finals, and even though Intel has yet to formally launch Haswell, the next few weeks will see multiple PC makers unveiling their summer lineups. First up: Sony. The company just introduced some new mainstream notebooks, dubbed the "Fit" family. These laptops, which replace the current E series and most of the T line, include the lower-end Fit 14E / Fit 15E, which are made of plastic, and the Fit 14 / Fit 15, which step up to a thinner aluminum chassis and optional SSDs. 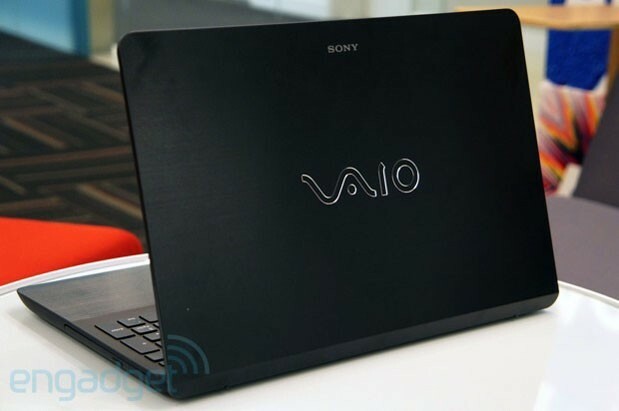 Either way, Sony is standardizing on certain specs across its entire summer lineup, including 1080p displays, backlit keyboards, NFC and Exmor R webcams for better low-light images. We've just spent a week testing the Fit 15, which will be available later this month for $700 and up. (The rest of the Fit line starts as low as $550.) Head past the break to see if it's worth a closer look once it hits store shelves. Seagate has come a long way in its attitude toward solid-state drives: it went from fighting the future to embracing SSDs with open arms, albeit only in enterprise at first. Now, it's launching its first-ever flash drive for end users, the 600 SSD. 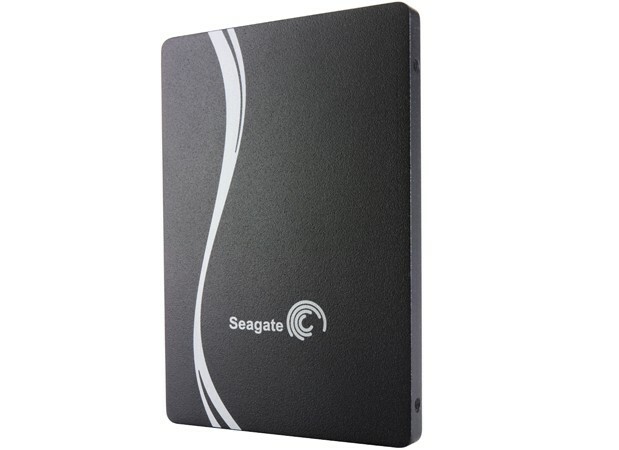 The storage will seem familiar to those who've gone shopping for regular SSDs, offering a 480GB max capacity, a laptop-friendly width and a 6Gbps SATA interface. Also, it may be just the perfect fit for those with extra-slim PCs: one 600 SSD variant will have the same 5mm height as Western Digital's Blue UltraSlim. Seagate hasn't disclosed its pricing, but the 600 SSD as well as the server-oriented 600 Pro SSD, 1200 SSD and X8 Accelerator should be available now. At the beginning of last week, we learned of a Huawei smartphone, model number P6-U06, by way of the TENAA in China (their FCC equivalent). In addition to some pictures of the handset and a few internal components listed by the TENAA, its thickness, or rather, its thinness was the most interesting spec -- at 6.18mm, it could be the super-slim P series model a Huawei exec has been teasing all year. While the company remains tight-lipped, the folks at NowhereElse have received what are thought to be some in-the-wild shots of the P6-U06, this time in black. 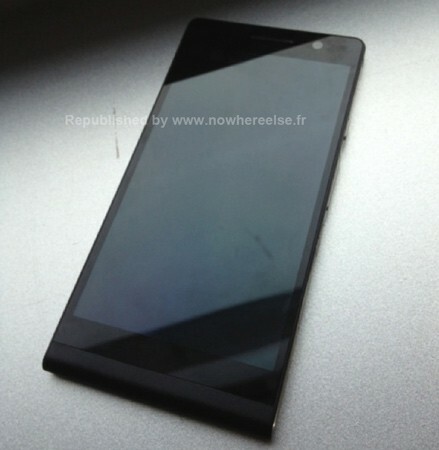 The French site admits it can't verify the legitimacy of the pictures, and there's none of the back that should show the Huawei logo, but they do marry up with what we saw at the TENAA, and it looks pretty trim. We wouldn't be surprised if Huawei made it official sometime soon, if only to stop the leaks before we know it all and lose interest. There are a couple more pictures after the break, and luckily, it appears Mr. Blurrycam was on another job. 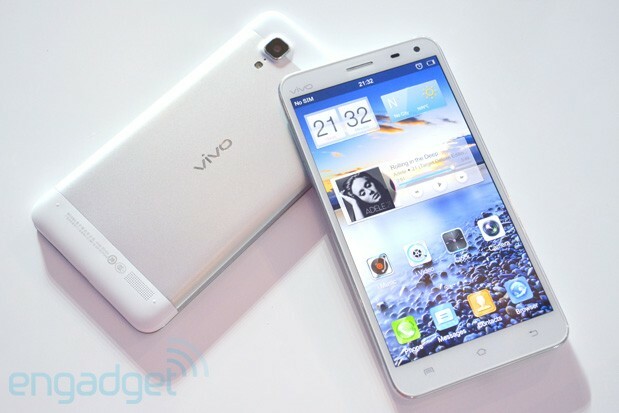 Another 1080p quad-core Android phone, you say? Well, there's a bit more to it. Launched by BBK spin-off Vivo in Beijing just now, this 5.7-inch Xplay goes one step further than its smaller X1 and X1S cousins by packing one extra audio chip, the OPA2604 op amp from Texas Instruments, in order to add extra oomph to Cirrus Logic's CS4398 DAC and CS8422 stereo asynchronous sample-rate converter -- both of which are featured on the X1 series. If you're a DIY audio enthusiast, you might have already tinkered with an OPA2604 while making your own headphone amplifier; so in other words, Vivo is trying to save you the hassle. Before we dive into the audio performance, let's quickly look at the rest of the phone first. Underneath the 500 nits LTPS display lies a Qualcomm Snapdragon 600 quad-core SoC (1.7GHz, 2GB RAM and Adreno 320 graphics engine), 16GB or 32GB of built-in storage, 3,400mAh battery and NFC. On the back you'll find the increasingly common Sony 13-megapixel imager next to a pair of speakers (FLAC playback is supported natively, by the way), but flip the phone over and you'll be looking at a surprisingly generous 5-megapixel front-facing camera -- much like the one on Oppo's mid-range Ulike 2. Vivo's somehow managed to pack all of this into a 7.99mm-thick body, while boasting a screen bezel of just 2.3mm thick (sorry, Pantech!) and a large viewable-to-total area ratio of 75.11 percent. Alas, for 3G there's only WCDMA 2100, meaning the phone may have to rely more on GSM 850/900/1800/1900 or WiFi in many parts of the world. More after the break.